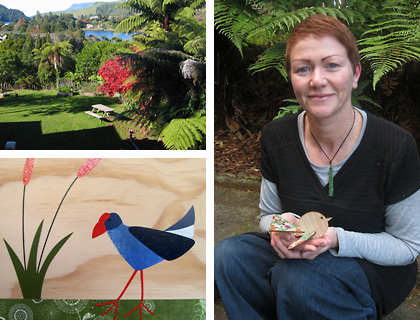 From her studio overlooking stunning native bush in the beautiful Bay of Plenty, Aly Bennett has built up her craft business, Native Creative, from an original range of collages on plywood to a collection of innovative product designs inspired by New Zealand birdlife. I make unique native creations out of printed plywood which are inspired by NZ’s wonderful bird life. 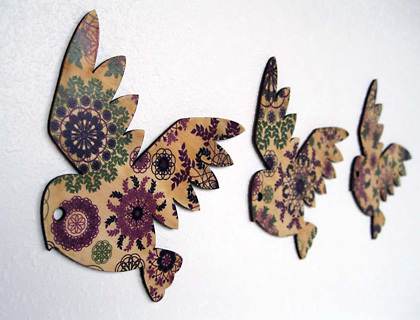 I design my own patterns to print onto the plywood which are intended to reflect the personality of each bird. To date my range includes collages, prints, slot-togethers, mobiles, wall decals, brooches and a jewellery tree. I’m also soon to release my first piece of furniture which is very exciting! I’ve always had a creative itch and with two preschool aged children I wanted to find something I could do from home where I could dictate my own hours. I started out with collages of native birds applied onto plywood blocks. Eventually, after really falling in love with plywood and all its possibilities, this led on to the creation of my other products. No. In the past I’ve worked in many industries including advertising and web design (in non-design roles) so was often surrounded by creativity which I found inspiring. This meant I’ve always been proficient using a computer and am good at ‘organising’. It feels so great now to have found a medium that I LOVE which is becoming successful. I must add that the creative, technical and woodworking talents of my husband have been invaluable in helping to develop my ideas. Native bush, lakes and rivers, bird song, beautiful handmade items, clever upcycled products, people who care about each other and the planet, quirky stuff, light and shadow, the changing seasons, my gorgeous children and talented husband… I could go on and on! I adore native NZ birds which so far are the inspiration for all my work. The native birds that have motivated my creativity will be seen and heard less if we humans don’t co-exist in harmony. It is my wish that collectively all humans can make a commitment to enjoy – not exploit – nature’s richness. 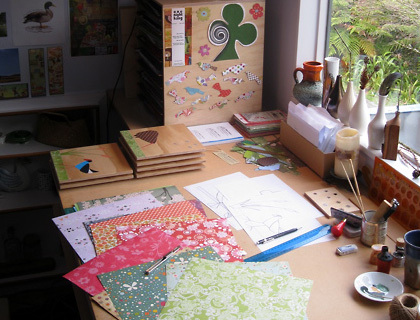 Initially with my collages it was all about plywood, sandpaper, scrapbook paper, craft knife, cutting mat and glue. However I’ve now taught myself how to design my own patterns so lately I’ve been spending a lot of time on my Mac making pretty patterns and drawing up the shapes that make up my products using Illustrator. I also spend plenty of time in the workshop sanding plywood and then have it printed and lasercut by local (Rotorua) businesses. Semi-organised, busy, colourful and warm with inspiring views and constantly in need of a jolly good vacuum cleaning! I’m lucky as it’s separate from the house so I can escape and then walk away when I need to. Green Eggs and Ham, A Big Ball of String, The Digging-est Dog, Ten Apples Up on Top, Come Over to My House… just love those “Beginner Books” which my mum has passed on to me for my own children. My favourite magazine which arrives in the letterbox every two months – NZ Life & Leisure. It’s full of hugely inspiring stories of people living their dreams and I read it from cover to cover. ALSO I’ve just received in the post How to be a Woman by Caitlin Moran after hearing her entertaining interview with Kim Hill. A very funny and wise take on feminism. An English Pointer dog named Koko who loves to come out mountain biking and swimming in the lake with us. I would like to think of myself as an earthy green colour but I have to admit that at times I turn into a fiery orange. The full Native Creative range is available on Felt and you’ll find Aly at the monthly Little Big Markets at Mount Maunganui this summer. To keep up to date with new products as they’re added to Felt, follow Native Creative on Facebook. Oh your birdies are so beautiful, pure joy !!! Hummmm … I know a few walls in need of a feathered freind. I think your jewellery is absolutely beautiful.